Madella Hagerthy was born on October 26, 1922 in Andover, South Dakota. Her parents were the late Tyler and Beatrice (Yost) Hagerthy. Madella grew up in Aberdeen, South Dakota, until she was 10 years old, when they moved to Minneapolis, MN. She graduated with the Class of 1940 from Central High School in Minneapolis. She attended Winona Teachers College and graduated in 1942. On July 3, 1943 Madella was united in marriage to Theodore “Ted” Siirila. Their marriage was blessed with three children. Ted and Madella lived in Glendale, California from 1947 to 1997. Ted and Madella spent their summers in New York Mills, MN since 1984, until moving there permanently in 1997. Ted passed away on April 12, 1999 in Wadena, MN. Madella continued to live in New York Mills. 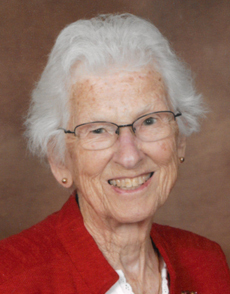 She enjoyed traveling, reading, crossword puzzles, bird watching and listening to music. Madella had a witty and great sense of humor. She was a current member of Trinity Lutheran Church in New York Mills and a member of the Charles D. Center V.F.W. Post #3289 Auxiliary of New York Mills. On August 21, 2018 Madella passed away at Perham Living in Perham, Minnesota at 95 years of age. She will be dearly missed by her family and friends. Preceding Madella in death were her parents; husband, Ted; brother, Ford Hagerthy, sisters: Lona Bastien, Virginia McMasters, Irma Hagerthy, and Joyce Mabry. Madella is survived by her daughters: Judith (Yoav) Paskowitz of Glendale, CA; Mary (Kevin) Vorderbruggen of New York Mills; son, Dalton Siirila of Burbank, CA; 3 grandchildren: Cory Vorderbruggen of Circle, MT; Lauri (Shaun) Van Dyke of Moorhead and Kyle Vorderbruggen of New York Mills; sisters-in-law: Betty Siirila of Wadena; Relma Siirila of Henning and Arlene Siirila of Carlos; brother-in-law, Rowland Bauck of New York Mills; many other relatives and a host of friends.